Bill Koffler credits the success of his 10- year old composites company to “smart, hard work”. Being located in Bristol, Rhode Island, Aquidneck Composites boasts a growing project portfolio tending toward high-end boats, ranging from smaller rowing vessels to sleek, worldclass catamaran stretching 20 meters or more. Bill’s boat building crew is skilled at blending form and function through the use of technology and old world craftsmanship; he is called upon by avid sailors and adventurers destined for big things: sailing around the globe and solorowing across the Atlantic. 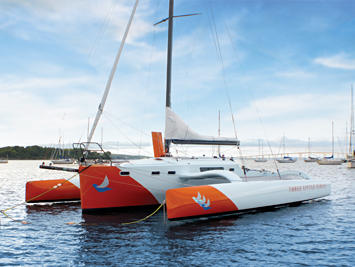 Three Little Birds, a sleek 11-meter trimaran designed by Dave Welworth, was constructed from uni–directional S Glass with Plascore Nomex® honeycomb used as the hull core, a change from traditional SAN (styrene acrylonitrile) foam. Made of aramid fiber, Nomex® honeycomb is typically used in racing boats for its high stiffness-to-weight ratio; it’s extremely light, with high temperature stability for both wet preg and pre-preg applications. Lighter and stiffer than any foam available, Nomex is a great partner for thermoset epoxies. When bonded, the aramid fiber material has exceptional shear strength and ‘does the work’ of carrying the shear load of the sandwich, freeing the engineer to create sleek, lightweight designs. The lightweight characteristics of Nomex® honeycomb also makes it a go-to core for bulkheads and interior panels, often used with beautiful hardwoods such as cherry, allowing designs to effectively increase buoyancy while strengthening the structure. Curved surfaces, such as boat molds, are best suited for overexpanded Nomex® honeycomb, which drapes easily in the direction of the overexpanded core cell. The wide cell makes it easy to lay the composite in the mold without fighting core memory and the need for continual trimming associated with foam cores. Out of the mold, Nomex® fairing is dimensionally uniform; the crew can immediately lay in S Glass without refairing core seams, a tedious, dusty and time-consuming process required of SAN foam. The high shear strength properties of Nomex® core combined with S Glass rivals the strength of carbon fiber and foam without the harshness or noise on the water. This is especially critical on long voyages, where pilot fatigue and crew comfort are all considerations. ACC wet preg process saturates the glass fiber while eliminating resin-rich voids that add unnecessary weight. The pattern-cut Nomex® honeycomb is placed on the glass and allowed to settle before being vacuum bagged into plastic. The composite lays down in the mold, easily forming to the tool without the excessive trimming often required to fit foam. This one-step process requires less energy with more dimensional uniformity. “The thermal formed core process is never exact. You might be working with four or five pieces to refit into the mold, each piece with a memory and awkward fit needing correction before vacuum bagging. With wet preg Nomex®, we take advantage of more controlled fabric to resin ratio and predictable resin binding. When we router cut the Nomex®, we cut the sheets to the exact pattern. Done.” Says Bill. Boat building, even at the high-end, is a competitive business; a continual balancing of cost and performance. While Nomex® honeycomb commands a higher material cost compared to foam, that cost is more than recouped in labor savings. For more information visit Aquidneck at www.aquidneckcustom.com.